Over the years I've spoken with many amateur astronomers about how their interest in the sky was fired-up upon receiving their first telescope. I can still remember when I was 9-years old peering at the moon through my own new telescope; the view was absolutely entrancing and ever since – for more than 40-years – I have never tired looking in looking up at the sky. Perhaps you are now seriously considering purchasing a telescope, either for yourself or for someone else. Here's a brief overview of what you must know first. It's easy to look at the spectacular images in astronomy books or on the web and arbitrarily assume that you're going to see similar sights through a small telescope. But remember that most of those stunning views were likely taken with large observatory instruments and through cameras employing long time exposures, which bring out all the intricate details and colors. That's not, however, what you're going to see through your backyard telescope. But a good small telescope can reveal a surprisingly rich and varied array of celestial wonders. Let's begin with our nearest neighbor in space, the moon. Because it's the largest and brightest object in the nighttime sky, the moon is a natural target for small telescopes. Even 30-power – which can be found in a relatively small and inexpensive setup – will show a breathtaking panorama of smooth dark regions and rugged highlands pockmarked by hundreds of craters. With higher powers, the moon completely fills the eyepiece field. By letting the moon slowly drift across your line of sight, you can imagine being an astronaut peeking out at a desolate world through the porthole of a spaceship. You'll be surprised how quickly it moves clear out of view from a fixed-position telescope. Of the planets, there are many things you can easily see with a modest 40-power: the changing phases of Mercury and Venus (yes, much like our moon these planets go through phases); Mars' distinct pumpkin-hued disk; the four moons that orbit Jupiter's banded globe; Saturn's rings and bright moon Titan; and the starlike points of light that are Uranus and Neptune. By stepping up to higher magnifications, so long as you buy high-quality optics (not the sort of thing you'll find at a department store) you'll be able to glimpse the polar caps and dark markings of Mars, Jupiter's enigmatic red spot, Cassini's division in Saturn's rings and even the tiny bluish-green disk of Uranus. And if you observe from a location far from bright city lights, you'll be able to see double stars, star clusters, nebulae and the Great Andromeda Galaxy that lies 2.2 million light-years beyond our own Milky Way. 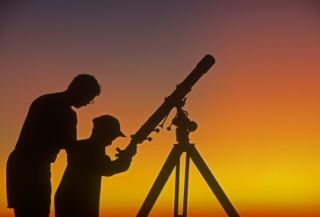 Yet, while it is true that many have been "hooked" for life by viewing the wonders of the sky through their first scope, it is also true that many others have had their initial enthusiasm for astronomy severely dampened by their first telescope – especially if the pleasure-to-frustration ratio becomes too low. I'm about to make a suggestion that few prospective telescope buyers – especially those neophytes of astronomy – do not want to hear: Seriously consider the merits of binoculars before moving up to a telescope. "First, spend some quality time under the stars and then, when you think you're ready, go out and purchase a pair of good binoculars." Some might think that binoculars are a bit of a come down from a telescope, but the fact of the matter is, that for certain aspects of sky watching they are the best instrument of all to use. A pair of 7-power binoculars is lightweight and portable. And quality binoculars can far outrank a poor quality small telescope and is an instrument that should last you a lifetime. Beginners usually are pleasantly surprised the first time they sweep the night sky with binoculars and advanced amateurs and professionals alike regard binoculars as standard viewing equipment. The 7 refers to the magnification, while the 50 refers to the diameter of the two objective lenses measured in millimeters. My own personal preference, are 7 x 35 "wide-angle" binoculars that provide a much larger field of view (11-degrees) as opposed to most other units. Any good pair of 7-power binoculars, when held steadily (or mounted on a tripod) will give you a glimpse of the craters of the moon, the crescent of Venus and the moons of Jupiter. Should a bright comet come along, there is no better instrument to give you a great overall view of both the head and tail. And by just sweeping along the Milky Way, you'll be treated to a myriad of stars. Lastly, if your budget is $100 or less you'll be better off buying binoculars.